You can always expect people to rave nonsensically about their hometown. Usually they're just ignorant bigots. Sad, but that's life. Sometimes however, they're actually right, and that's when it becomes really irritating. I'm in New York for the week-end. Around lunchtime, while looking for a good Deli, I saw a priest wearing a $2000 Armani jacket over his frock. He was more than ridiculous, he was a walking insult to good taste, and very probably christianity – although I wouldn't know much about that. 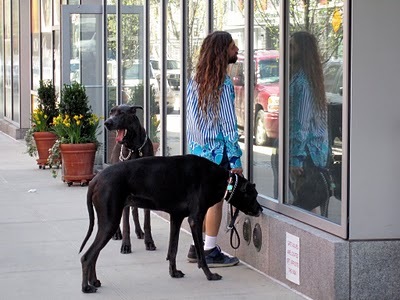 Earlier in the morning I saw a rundown hippie trip and fall upon the dogs he was walking– the biggest, meanest great danes I'd ever seen. I was sure the dogs would panic and drag the poor guy into incoming traffic, but they only looked at him with haughty condescension – not an expression that comes easily to a breed of dog with misshapen ears and overactive salivary glands. 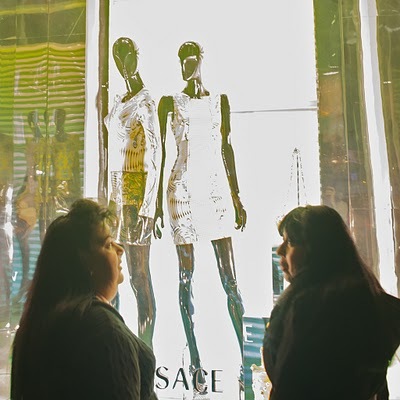 As the evening fell, I passed the Versace store on fifth avenue, where two grossly overweight women were gazing at the predictably anorexic mannequin and arguing on which dress would look best on them. 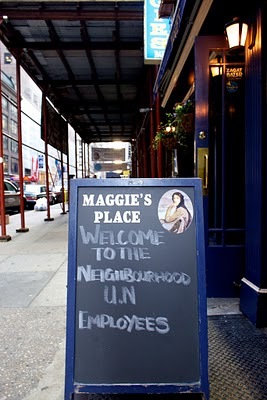 Had dinner in an Irish pub which proudly welcomes UN workers from the neighborhood. Heard conversations in languages I didn't even recognize. Four different languages I didn't recognize. Oh, I also shook hands with Homer Simpson. And I haven't been here 24 hours. What's amazing about all these little stories happening around me is that I am not even remotely trying to have an interesting time. I am proofreading a big project proposal and thus spend most of my time in front of a computer, working. But for the facts that I'm doing this in various Starbucks instead of at home, and that I'm sharing a dorm with 11 men I have never met, this could be just another day at the office. At one point I came across an alternative-looking clothing shop and went for a quick look inside. It was full of rock-and-roll paraphernalia. Old amps. Posters. Alice Cooper's gold and platinum records. 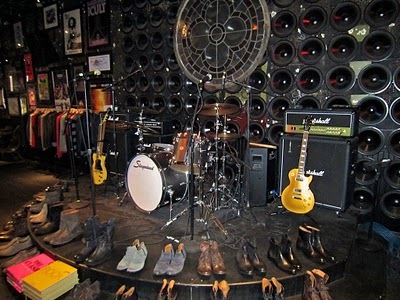 The shop belongs to John Varvatos, a designer from Detroit who recently made it big selling rock-and-roll-inspired quality clothes. He apparently designed many of Cooper's stage outfits and hired him to showcase his current line – in return he got the trophy records as a gift. As I chatted with the saleswoman, she told me the shop's whole story: it was formerly known as the CGBG club, and the birth place of Punk Rock. The Ramones played there before they were famous. A couple years ago though it was only a shadow of its former glory, and tenants wanted to close it down. 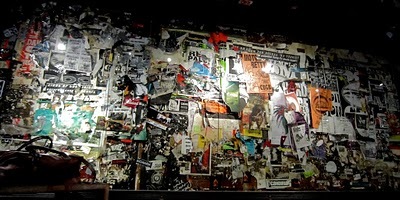 Enter John (Varvatos), who walked by it in broad daylight, gazed inside, and thought he could turn it into an underground-looking fashion store with very little work. So he did. It looks awesome. It even has a stage where live concerts happen from time to time. I was fascinated. And rather shocked that I was only discovering the guy then and there. An award-winning fashion designer who buys run-down Punk Rock clubs and hires Alice Cooper as a model strikes me as someone I should have heard of. But I had not. Come to think of it, I had never seen a platinum record up close either. But now I have. Just because I took a random walk in the east village looking for AC power and a latte.